When man vanishes, what will Earth look like? I worked with two post-apocalyptic role-playing games in the 1980s and 1990s: Mutant and Wastelands. 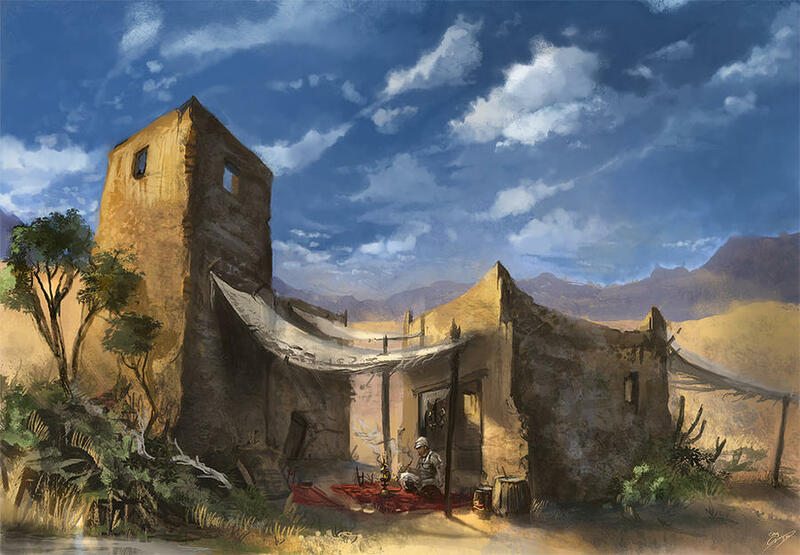 They each introduce settings in which the current civilization has been destroyed, resulting in two dissimilar game worlds, the grim and serious Wastelands Europe and the less serious Pyri Scandinavia. However, after watching this video, I realize that my background research was insufficient, particularly in the Wastelands setting. For instance, there would have been extensive problems with the plentiful hydroelectric power stations in northern Sweden: cracked dams, flooded river valleys, and swamped riverside towns. 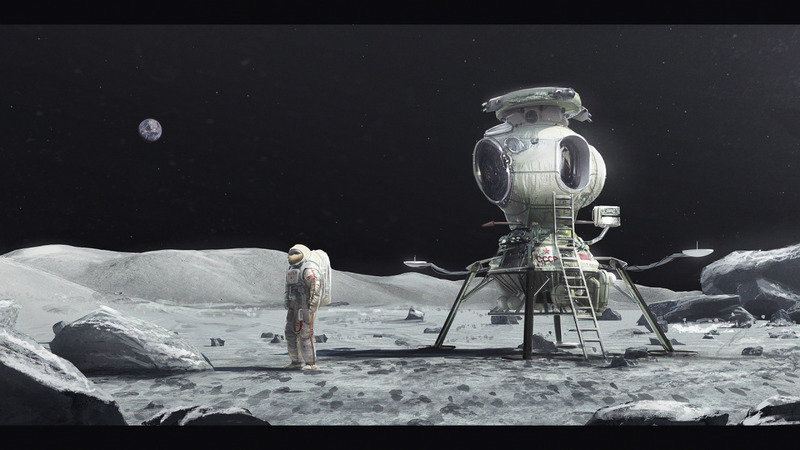 Space That Never Was is an art project by illustrator Mac Rebisz. The goal is to make technologically accurate depictions of space missions that could have been executed if the US/Soviet space race had continued for another decade at the hectic pace of the late 1960s, with manned expeditions to Mars and beyond. The Soviet moon landing depicted above (click on the picture for a larger version) was on the way around 1970 and the one-man lander would have looked like that. However, the endeavor foundered because of insoluble problems with its huge N-1 rocket. I like the artwork of the Star Wars IV-VII movies and I like the style of diesel-era aeroplanes. This painting combines these two aspects into one great-looking design. The general layout of the picture suggests that the artist is a member of the Clavework Graphics team. but it’s the way that is the labour’s worth. This poem could be a creed for us role-players, regardless where we live and what we play. It was written in the 1930s by Swedish author Karin Boye (1900-41), and has been translated into English by David McDuff. Ms Boye’s crystal-clear poems about rootlessness and finding your own path through life have accompanied me on my journeys since I was a teenager. Picture by Flavio Bolla at DeviantArt. Click on it for a larger version. Sea Warfare is an unexpected little non-fiction book by Rudyard Kipling, the Nobel Laureate who today is famous for poetry and short-stories dealing with imperialism and the Indian Raj. I recently found an ebook edition free of charge at Amazon. The book was written in 1916 or 1917 as a piece of propaganda to bolster morale on the Home Front. Nevertheless, Kipling rarely wrote poorly so this remains an interesting volume despite occasional outdated views and phrases. The reader learns of the everyday toils of the Royal Navy’s non-glamorous small craft, e.g. minesweepers, destroyers and submarines. Kipling used after-action reports and interviews with ratings and officers as his sources, though he changed many ship names because of wartime secrecy. Despite the obvious bias, i.e. chivalrous Britons fighting cruel “Huns”, these stories tell a lot about sailors’ wartime chores, for example, the hardships of mine-sweeping in the North Sea and the harrowing experience of serving aboard a tiny destroyer facing the Kaiser’s battleships in the titanic North Sea clash that is called the Battle of Jutland. The book also addresses a few matters that I had not heard of before, for example the British submarine operations at the outskirts of Constantinople during the Gallipoli campaign in 1915. Tiny subs hunted Turkish ships in the constricted waters of the Dardanelles Straits and the Marmara Sea, hampered by mines and shore batteries; an underwater campaign very different from the one that Germany pursued in the North Atlantic at the same time. I write diesel-era adventures and Sea Warfare provides me with useful setting information for future stories. I have already outlined a riverine tale in the Patchwork World setting. So my verdict is four armed trawlers out for five. The year is 1891 and the place is Mars. 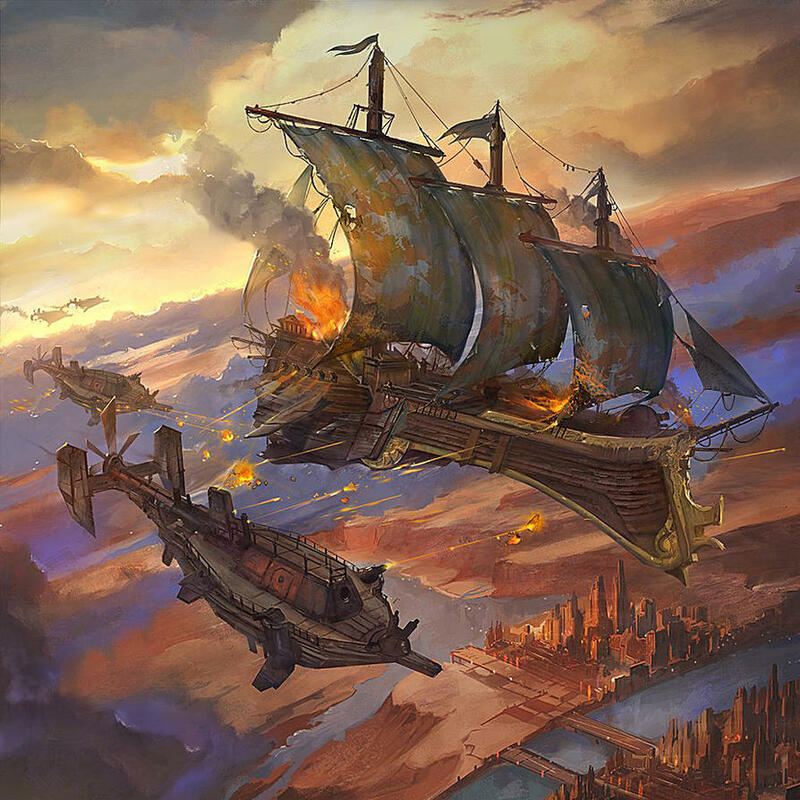 A pack of steam-propelled airships slogs it out with a sky frigate above a canal city. The small ships display no flags, so their attack is a case of piracy and not a legitimate act of war. This is a scene from the Victorian science fiction game Space 1889 (link >>> ) by Frank Chadwick. This has been my favorite game since the early 1990s; my buddies and I have experienced scores of adventures in the dilapidated cities and cold skies of the Red Planet. Summary in English: A storm striking an island city in my Swedish fantasy RPG campaign Skymningshavets gåtor. En dramatisk scen som hämtad från Skymningshavets gåtor, min ännu inte publicerade sjöfararkampanj till retro-Drakar och Demoner.